Proper financial planning can demand some time and effort from both the adviser and the client. There are some clients who do not want to undergo such trouble, never mind the fact that it is ultimately their financial interests at stake. Many practitioners recognise this as well as the fact that commissions come from product transactions, coming up with their own process focusing on sales. Sales practitioners look for the path of least resistance. 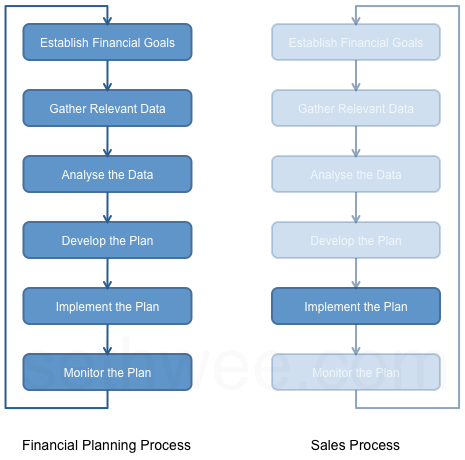 The financial planning process typically consists of 6 steps. The adviser must first establish the client’s financial goals in order to have a clear desired outcome to work towards to. He then next collects relevant data about the client’s financial circumstances. The collected data is then analysed so that any problems can be clearly identified and the adviser is aware the resources available to fix such problems. The adviser then develops his advice and recommendations. An Independent adviser would be able to draw upon the wide range of financial solutions available to him to better benefit his client. Subsequently, the adviser will present the recommendations to the client who then decides whether to execute the implementation of the plan. Products that are recommended have to be explained, including the various features and potential drawbacks. Once the plan is finally implemented, monitoring and reviews should be done from time to time. Depending on the complexity of the the plan, it can either be on a as-needed basis or on a agreed upon regular basis. A financial salesperson has a more “straightforward” process. He may collect some financial data, invariably how much one can set aside a month, and then move onto elaborating on a certain product’s features and benefits. It does not matter if he is unable to make the sale, as in the time an adviser spends in the 6-step process, he can meet many, many people. Through the law of large numbers as well as by promoting high margin products, he only needs to make a single sale to reap a good profit. The client may receive ongoing service and review if he is lucky, although most times it may just be another opportunity for a sales pitch for another product to be made. Clients should “take the trouble” and go through the entire financial planning process. It is ultimately their own financial interests at stake. I encourage my clients to take time off work to visit me at my office to properly undergo the process. It is unrealistic to expect an adviser to travel all over the place like a salesperson does and still do proper planning due to the often lengthy and detailed process it entails.